Risa Section | Ing. Miroslav RUSINAK s.r.o. RISASection allows the user to define any type of complex cross section either by combining standard shapes or by defining new shapes. Multiple materials are permitted in the same section. RISASection calculates all the section properties, including the torsion constant. Sections created in RISASection may be used in RISA-3D, RISA-2D, and RISAFloor. RISASection includes many powerful editing features such as automatic stacking and aligning, unlimited UNDOs, as well as the ability to create beautiful reports with cross section graphics and much more. The program supports imperial and metric units. When creating shapes you can use the convenient „snap to“ grid, or specify the coordinates of each shape directly. Of course, comprehensive online help is also included. 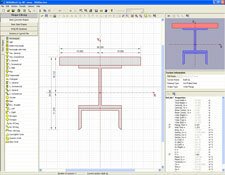 RISASection calculates typical section properties for multi-material, built-up structural sections. Use the built-in database of standard concrete, hot rolled and cold formed steel sections, or modify standard shapes to create your own. Calculates transformed section properties for composite sections, including torsional constant. Export to RISA-3D, RISA-2D, and RISAFloor. Sections can be created by combing basic concrete shapes, hot rolled steel shapes, cold formed steel shapes, HSS shapes and built-up shapes. Section properties are computed immediately and are automatically updated after modification of the Section. The program works with a completely interactive, graphical interface so you can easily edit the dimensions. Geometric properties may be computed using gross section, homogeneous section, or on the basis of equivalent section. Complete integration with RISA-3D, RISAFloor and RISA-2D. A comprehensive report can be generated including summary of overall properties of each individual Shape in the Section. The graphic view and the output show the shape and dimensions of the Shapes and Sections and also show the rendered, solid view. Several sections can be defined in a single project/working file. Unlimited Undo option is available.